Stable, dry and calm weather is prevailing over much of Pakistan and that is after all October. But now some change is likely to come. *High pressure is seen over Rajasthan and Sindh extending into South Punjab, adjoining Balochistan and the northern Arabian sea. *Westerlies are dominating the country. *Drop in temperature is expected during the end of the October mainly in northern parts of Pakistan. There is about 25% – 30% probability that western disturbance 04 would affect upper parts of Pakistan from October 20 including Islamabad, Khyber, Gilgit and other surrounding areas. Karachi: Weather as calm as peace in the city! Temperatures rised to 36 °C in Karachi as forecasted by Pakistan Weather Portal (PWP) on October 9, however now the temperatures will start to drop. Wind direction since past few days was also unstable in city mostly blowing from land towards sea that is Northerly however south-west did manage to blow from time to time. No rainy activity is likely in Karachi and other parts of Sindh till many days. Low pressure formation in the Bay of Bengal! An upper air cyclonic circulations in the east central Bay of Bengal is likely to intensify into a low pressure area or further in the next 1 to 2 days that is likely to head in a North direction towards the Bengal region of the Sub-continent, the wind shear in the Bay of Bengal is also very little. However it is worth mentioning that since last one year Bay of Bengal has been very quiet. With no major depressions or cyclones. 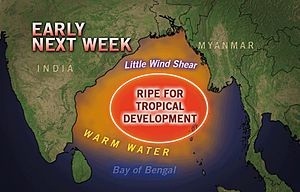 PWP hopes that the Bay of Bengal starts to behave normally! ← 2011 Sindh floods – The misery continues! It has more greenery..that makes islamabad more beautiful..
Salam Babar Bhai.Sindh m koi barish k chances hein is month k end tk??? Yes, there is a low pressure in SE Arabian sea but will it reach cyclonic storm status on IMD scale? thats too early now, westerlies are dominating much of PAK so low will have difficulty moving towards our coast if it tries to do so. There is indeed a Low in ARB…but its chance of becoming a cyclone is quite low..too early to talk about its final destination..
babar u told about an other low or uac in bob? It was a UAC that dissipated.. tropical activity has been delayed in BOB, may revive in second week due to UAC coming from Malay peninsula. salam,babar bhai storm kay 100%chances hai ya nahi?aggar storm active hota hai to pakistan ko hit kar sakta hai ya nahi. Walaikum assalam Abdul.. depression has formed … it may intensify slightly more.. and move towards Oman..
Its a well-marked low and it may intensify into a depression in 24 to 36 hours. 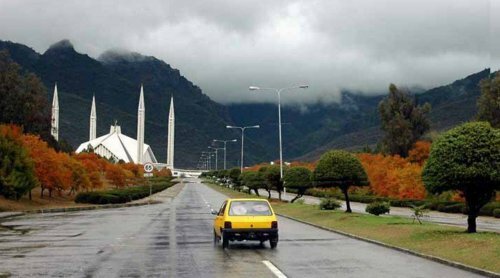 Wonderful view of Islamabad in rain.